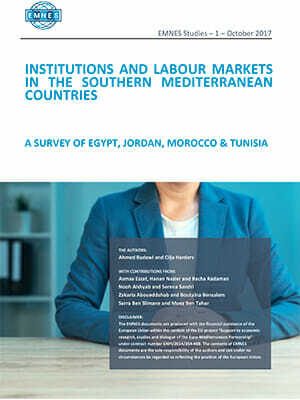 EMNES published a new study under the title : Institutions and labour markets in the Southern Mediterranean countries – A survey of Egypt, Jordan, Morocco & Tunisia. The study provides a survey of the institutional environment in which labour markets in Egypt, Jordan, Morocco and Tunisia are embedded. The paper presents an overview of the main recent demographic and employment trends. It then provides a comprehensive analysis of those sections in the constitutions of the four countries and of the various labour laws and regulations that are relevant for employment and social justice. In addition, the paper explores the role of informal institutions and practical norms in shaping the behaviour of employers and employees, and highlights the problem of the weak capacity of the state to enforce labour market rules. Euro-Mediterranean Economists Association ©2015 | Developed by ENKI Technologies.